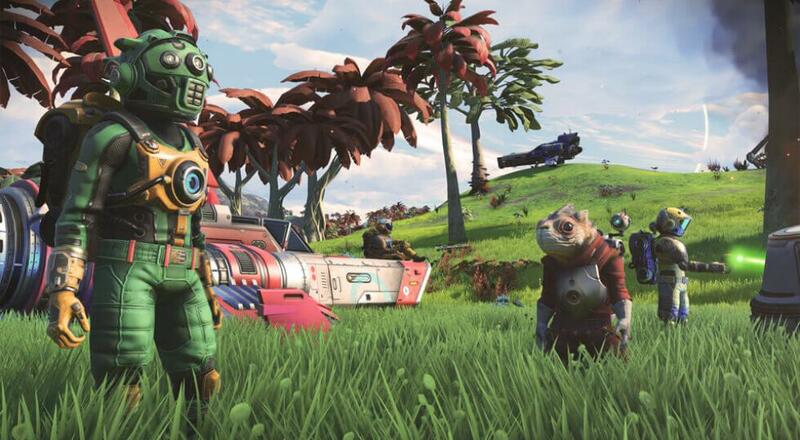 We've been waiting for more details about what all the update includes and adds before reporting on it and including the game in our database, and while there are a few fuzzy edges still, the new trailer and post over on the official No Man's Sky website helped fill in some of those previously missing pieces. Based on what's said and shown, it seems like you'll be able to team up with three other players online and go on a space adventure through an entire procedurally generated universe. There are planets to discover and explore, local flora and fauna to categorize (and name), and mysteries to uncover. While the title was very bare-bones when it first launched back in August 2016, the previously mentioned updates - "Atlas Rising" in particular - added a more defined course to follow if you prefer a little more structure. It's worth mentioning that while you can team up and play with others, the game is also open to other players flying and messing things up, i.e., "griefing." As the larger intent behind this update appears to be enjoying this huge universe with buddies, we consider this to be a co-op game, though we've flagged it with our new "griefing possible" warning in our database. No Man's Sky is currently available on PC via Steam and GoG.com, and via the PlayStation Store on PlayStation 4. The "NEXT" update will be available for free to all existing owners of the game and it will be available to download next Tuesday, July 24, 2018. No Man's Sky will also be available for the first time on the Xbox One next Tuesday, July 24, 2018. Page created in 0.8194 seconds.